A place to escape after a busy day … a place to share time with family and friends. Plus having your yard the envy of the block is pretty nice too! What many homeowners don’t want is the weekly toil and labor of maintaining such a yard. The lawn care professionals at Corning Landscape ensure that your yard will get the care it needs to thrive. Weekly Lawn Service – Lawn service is provided on a regular basis. The lawn is mowed, edges along the walkways and garden beds are trimmed and the hard surfaces are blown clean. We try and get to each property on the same day and time each week. Of course sometimes the weather and equipment doesn’t cooperate and in that case we will be there as soon as possible. 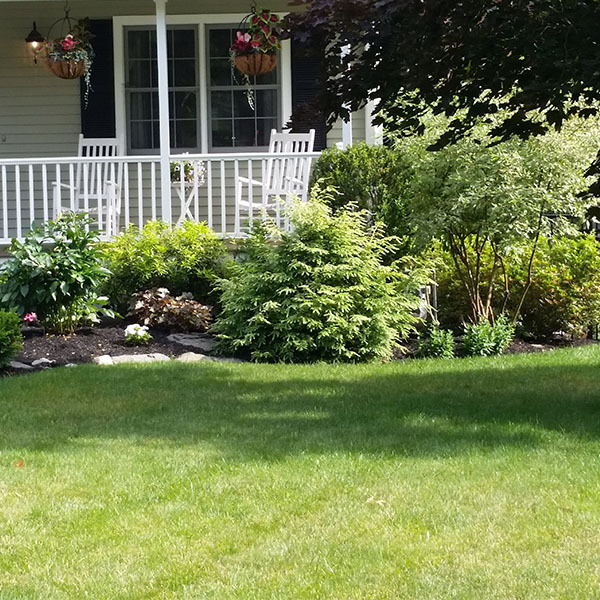 Fertilizer Programs – For our lawn maintenance customers we offer a five-step fertilizer program. This includes a pre-emergent pesticide to control crabgrass. The other applications vary depending on the season. The early summer application combines fertilizer with Grub control to prevent damage from the grubs feeding on the grass and animals digging up the lawn to eat them. We offer 4-step program to our full service clients. At this point I sub out some of the lawn spraying. Mulch – Each year we will pick up, deliver and install fresh mulch in the garden beds. We offer different varieties, including Hemlock, Dark Pine, Hemlock blend, Black Forest and Aged Hemlock. We also have access to an organic black mulch and compost for the garden beds too. 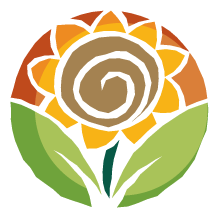 Garden Maintenance – This is a midseason service to remove weeds, turn over the mulch and cut back and remove the blooms of perennials that have gone by. This service keeps your property clean and tidy. Even the best-kept lawns can look a bit tired at times. 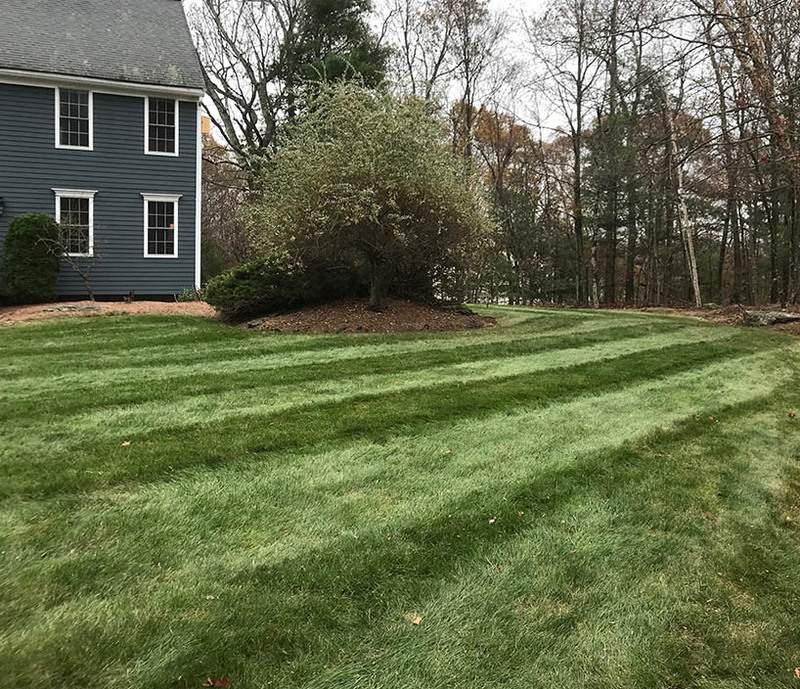 This could be from soil compaction, a tough winter, too much rain, lack of sunlight, dry conditions, poor soil, pests, even the age of the lawn. The list can go on. Corning offers a combination of different services that are tailored for your lawn. The first step in dealing with an unhealthy lawn is getting a soil test. This is an easy test that Corning is happy to coordinate on your behalf. The findings will let us know your soil’s pH, along with nitrogen, phosphorous and potassium levels. Then the lawn needs to be raked to remove excess debris. With the removal of old grass and weeds, more light and air reaches your lawn. Aerationis done to relieve soil compaction and allow nutrients, air and water to get to the root zone. This also provides better drainage and decreases soil compaction. Top dressing is a sand or prepared soil mix that is applied to the surface of the lawn. When applied after aeration, the materials filters into the holes opened by the aeration process and helps with turf recovery. Slice seeding mechanically slices the soil and drops grass seed into the grooves to help thicken up the lawn. Over-seeding is the method of broadcasting grass seed after aeration to establish need grass plants in the turf. Don’t despair if your lawn looks a bit sad. It happens. And it can be remedied.